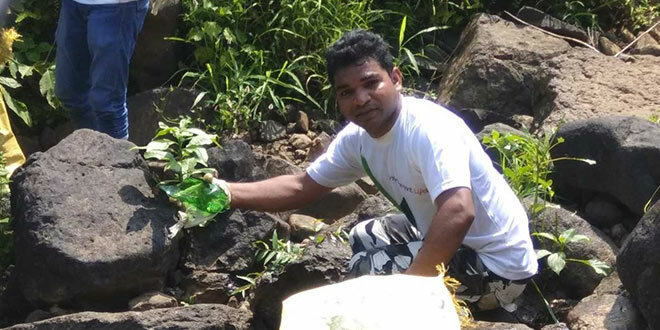 This 31-Year-Old Swachh Warrior from Maharashtra has cleaned 11 Waterfalls till date. 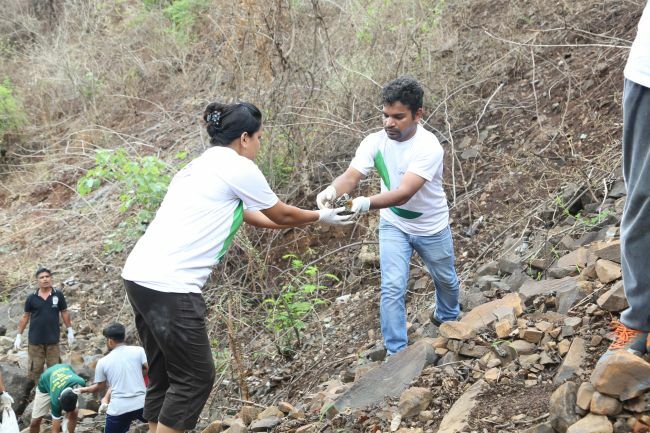 Inspired by central government’s Swachh Bharat Abhiyan, 31-year-old Dharmesh Barai from Maharashtra started cleaning up waterfalls in 2016 and has so far collected 6,720 kilos of garbage from 11 waterfalls Maharashtra. :For most weekends are to live it up in a way that puts to rest the trials of the week gone by and gears one up to take on what the week coming up has in store. From catching up on the latest movie to eating out, picnicking with family or partying with friends, there are many options and plans that the weekend comes packed with. But there are some for whom weekend is the time to invest not in themselves but to dedicate to a larger purpose in life. There are the like of Afroz Shah whose world renowned clean-up of Mumbai’s Versova beach with a team of volunteers every weekend is now into its 144 the week or Chinu Kawtra who inspired by Afroz has taken up the cause of cleaning up Dadar Beach. Then there is the 10-member team of an NGO that has been taking up environmental causes like tree plantation since 2008 – Environment Life. The core team of the organisation along with volunteers, armed with gloves and garbage bags take up the task of cleaning waterfalls every weekend in different parts of Maharashtra. For people residing in Maharashtra, visiting a nearby waterfall is one of the best weekend getaways. Right from Kondeshwar temple waterfall in Badlapur, Anandwadi waterfall in Neral to Pandavkada waterfall in Kharghar and Zenith in Khopoli, you can spot hundreds of citizens and tourists picnicking at these waterfalls. I myself have been visiting different waterfalls since 2002, when I was in class 10. Every time I visit a waterfall, I feel bad because 99 per cent of the visitors leave behind a pile of garbage and show zero interest in cleaning that up, says 31-year-old Dharmesh Barai, who since October 2, 2016, has spearheaded and successfully cleaned 11 waterfalls in the state. 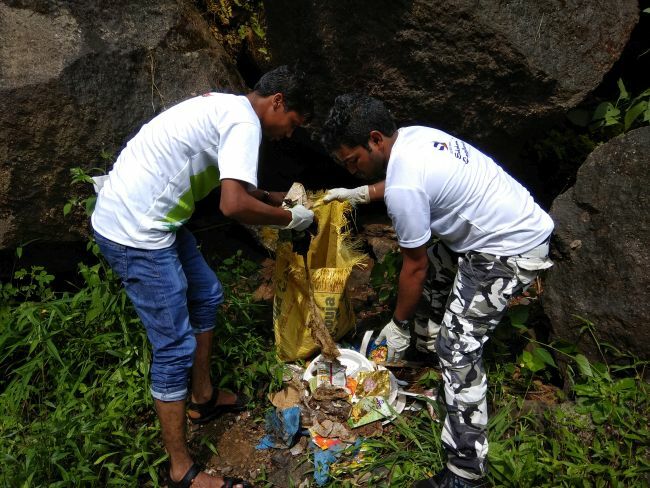 Combining his love for waterfalls with Central government’s Swachh Bharat Abhiyan, Dharmesh decided to clean up these places of natural beauty and preserve its fragile ecosystem. On October 2, 2016, Dharmesh kick started ‘Waterfall Cleanup Drive’ and since then there has been no looking back. As of today, the team has organised six clean-up drives, cleaned 11 major waterfalls and collected a total of 6.7 tonnes of garbage (6,720 kg). 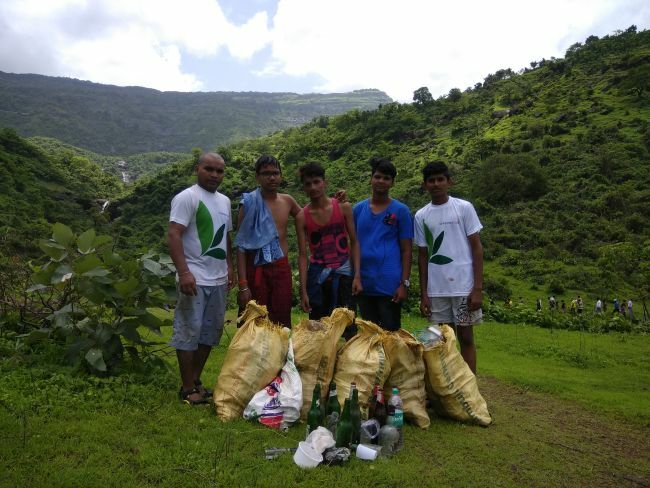 2,500 kg of waste was collected from Bhivpuri waterfall in Karjat Taluka alone. Of all the waste collected, 85 per cent consists of liquor bottles. Other waste items include- plastic and thermocol plates and cutlery, packaged water bottles, wafer packets. Often villagers hurt themselves while walking in their own area. Sometimes they step on broken pieces of glass bottle. There are days when animals eat plastic while grazing in the field. We might enjoy the majestic waterfalls, but our actions should not cause harm. The state of waterfalls in Maharashtra is such that loud music, littering, and drinking at picnic spots in Khalapur, and Karjat has been prohibited. Is banning a solution? I would say no. Then what? Awareness and stringent actions is the key. Clean up at waterfalls comes with its share of challenges. From recce to analysis of the state of the waterfall, to taking permission from the gram panchayat for the clean-up drive, then gathering volunteers to clean up the waterfall, sometimes situated in a remote area, demand extra hours and effort from the Environment Life team. Apart from all this, the core team contributes a sum of money for every clean-up. The fund is utilised to purchase gloves, garage bags, food for the team and volunteers. The major issue is to make people contribute in the clean-up drive. Sometimes local people show great enthusiasm and help us in cleaning their area, but then there are times when people don’t come forward. Like, we have twice organised waterfall clean-up drive at Anandwadi waterfall. When we went there for the first time, locals lacked awareness. They didn’t know the importance of cleanliness and hygiene. We conducted awareness session and the result was visible in the next clean-up drive. Locals, especially youngsters helped us in picking up the trash, says Dharmesh. The impact of ‘Waterfall Cleanup Drive’ is such that waterfalls are not only cleaner than before, but locals have also become conscious about it. Yes, the waterfalls are not free of garbage, but the amount of trash has come down to an extent and more can be done, if government takes upsome steps, says Dharmesh. Previous Post: Meet Jabbar Shah, the man from Uttar pradesh who sold his goats to build a toilet. Next Post: A 55-Year-Old distributed 1,000 Bio-degradable Ganesh idols For Ganapati festival.